Mensusa https://www.mensusa.com/articles/the-intimidating-ostrich-belts-for-men.html The Intimidating Ostrich Belts For Men Nowadays, every individual is style conscious and take care to dress themselves properly to look dignified. Not only so, men take special care about their accessories as well. Hence purchasing the ostrich belts for men is no big affair today. Dressing up in style is an art and portrays one's sense of fashion and preferences. Although all men wear suits, few notice the belts. But it is one of the most important accessories that enhances your attire and at the same time portray your status and dignity. So if you wear the ostrich belts for men at a party or even an important formal gathering, you will soon be noticed and respected by everyone by your dignified choice. 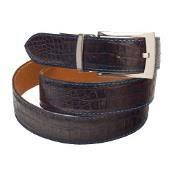 Ostrich belts are exotic belts that are not within the budget of every individual. If you are a well-established man and hold high position in the society, you will be able to buy these exotic leather belts that are quite expensive. There are some categories of men who are not satisfied with the regular products available at the stores that all men use like the leather belts and wallets and even jackets. They look out for exotic leather items to flaunt their style and status. Various exotic skin products are available today like the crocodile, alligator, stingray, as well as ostrich belts for men. If you wish to purchase an Ostrich belts to add a feather to your looks, visit MensUSA for the authentic Ostrich leather belts that are available in a variety of sizes, designs and colors. You can select according to your taste and requirements so that you can wear your belt not only as a necessary accessory, but an added flair to your entire looks. 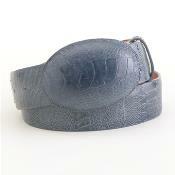 Ostrich belts for men are attractive, strong and durable. The different colors give you the opportunity to match them according to your outfits and the occasion too. Go for the gorgeous dark shades of Ostrich belt for a wedding party where you will naturally get noticed from a distance. The lighter shades like the white ostrich belts for men have an exclusive elegance and style that gives you an edge over others. Moreover, these belts match with almost all attire, and are appropriate for all seasons and occasions.